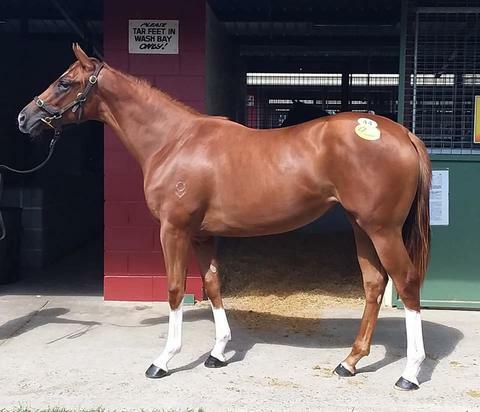 The filly by Spill The Beans (Snitzel) out of Rainbow Joy (Spectrum) is the product of a A+ or 20/20 mating which occurs when a pattern has two or more Graded Stakes Winners with CSI values above 20. This indicates that this pedigree is exceptional, as there are at least two superior horses, with a very similar pattern. Her pedigree page is bursting with elite juvenile winners, black type performers, producing broodmares and champion sires. A flashy precocious looking filly there is no doubt that she has outstanding looks but it is the family’s toughness and racing ability that really convinced us to add her to our stable.She is a half-sister to Lady Colours, Snitzel’s Joy, Mittere and Retrospect, and looks a likely type to add to her dam Rainbow Joy’s 100% record of producing metropolitan winners. Her Granddam Dancer’s Joy was a high-class 2YO winner of over $1 Million in prizemoney over distances from 1000m to 1600m. Dancer’s Joy won the Magic Millions 2YO Stakes, ran2nd in the Group 2 BATC Coca-Cola Classic, 3rd in the Group 3 VATC Blue Diamond Prelude and Listed Mercedes Benz Handicap and 4th in the Group 1 VATC Blue Diamond Stakes. The filly is a first crop representative, of undefeated 2YO, Spill the Beans, a Group 2 winning son of back to back Australian Champion Sire and Champion racehorse Snitzel. The filly is bred on the same successful cross as Group winners Land of Plenty, Savoureux and Doubt I’m Dreaming. The filly is both Magic Millions Race Series and QTIS Fillies Bonus Eligible which makes her well positioned to reap the rewards of added stakes.